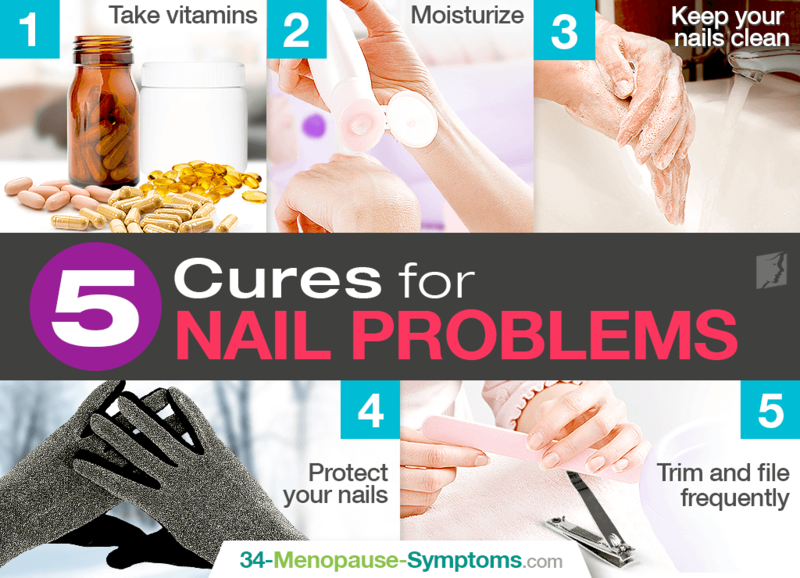 Nail problems are frustrating, sometimes painful, and often damaging to self-esteem. As the body ages, nails tend to grow weaker gradually, but certain things can accelerate these changes in nails. The menopause transition's decrease in estrogen levels appears to be one of the main reasons. For women going through menopause, brittle and breakable nails are a common issue, but they can be fixed. Read on to discover five simple cures for dry, brittle nails. To keep nails healthy and strong, you should ensure that you do the following. Several nutrients, such as calcium, are crucial to nail development, and they can be consumed either as part of a healthy diet or through taking vitamin supplements. Normal multivitamins often contain the necessary components to help grow strong, healthy nails, but there are also supplements sold especially for nail health. Dry nails are weak and brittle nails, so keeping nails hydrated should be a priority. Normal hand and body lotions are perfect for this task, as are several common oils, such as tea tree and olive oil, but there are specialty nail moisturizers available at many beauty stores as well. Although it seems simple, keeping your nails clean can have a significant effect on their health. A leading contributor to nail damage is nail fungus, which can be prevented and even eliminated with proper nail hygiene: scrubbing thoroughly with soap and warm water. Be sure to include your toenails in this cleansing routine. Environmental factors can play a role in causing nail problems, and any activities that cause more than normal wear and tear to your nails are likely to damage them. Try not to use nails for opening stubborn containers, and wear gloves in cold weather or when washing the dishes. As nails grow longer, the edges become more prone to chipping and breaking. Both trimming and filing nails frequently helps to remove the aging edges, and filing can help keep nails in a rounded square shape that is least susceptible to breaking. All nail polish has the potential to damage nails, but certain types, especially acrylics, are particularly bad. Fake nails can also damage and weaken the nails, so they should be used only sparingly, if at all. Cuticles are often treated as a nuisance, but they are a critical component of nail health. They should not be trimmed off, as this can damage their structure and undermine the nail's strength. While trimming nails is beneficial because it prevents them from ripping, picking at or chewing your nails will make them more likely to break and rip in unwanted ways. Hangnails especially should not be picked at, as they may easily become infected. Simple, common products such as hand sanitizer can cause your fingernails to dry out severely. Another harmful product is nail polish remover, so keep from using these items regularly. With these cures for weak, splitting nails, your nails should begin to grow strong and healthy again. To learn more about curing brittle nails, read about the best foods to help brittle nails. Read all about four vitamins and minerals to prevent brittle nails that every woman should include in her diet to return them to their original luster. Continue reading to learn about what you need to prevent your nails from breaking and cracking with the best manicure tools for brittle nails.